Clivia and I have only just met. I've been hearing about them for quite a while, both from people at Garden Web who are enthusiastic about them, and from a co-worker, but I don't often see them in the stores (the last one I saw in a store was in February, in Ames, IA, at a bizarre but cool little organic-greenhouse-slash-antique-shop1, but it happened to be next to a Fatsia japonica with a bad case of aphids, so I didn't give it much serious consideration). So I've had to wait. But, then, my wonderful co-worker 2 in the greenhouse brought in an offset of hers, and so now my Clivia adventure has begun. For the time being, I'm kind of flying blind; time will tell if this is going to work out or not. I am generally leery of plants with pronounced dormancies or wild seasonal swings in care, mostly because I'm afraid that sooner or later, I will make the switch too early, or too late, and I'll wind up killing the plants in the process. This is one of the reasons why I won't touch Lithops, though there are plenty, and it's why I am not inclined to deal with Alocasia either. I have been known to make an exception for Caladium, but my Caladium experiences have been so uniformly depressing that I don't think that's going to happen again. So we shall see. My plant is not large enough to bloom – I'm not sure how big they have to be, but mine only has three leaves, and the longest is maybe 14 inches, so I'm thinking it's going to be a while. This is fine. Like with poinsettias, or Anthurium andraeanum, I think the foliage is plenty nice on its own, and have no particular desire to see flowers. WATER: Keep dry from late summer to early winter (roughly Sep. – Jan.) and moist at other times. OTHER: Feed monthly when in active growth (Jan. – Aug.) and repot as infrequently as possible. Use a soil that drains well and doesn't hold a lot of water, to avoid rot. All this adds up to a 4.4 rating, mostly on account of the overwatering, bright light, cool temperatures, and moderately heavy feeding. I'm keeping my fingers crossed on this one; I know it's possible to keep them indoors, so it's really just about how many times I'm going to have to try before it works. I love your blog, I read it s soon as it is updated, but one pet peeve I had to share with you.....your footnote numbers (1), I just hate scrolling to the bottom of the page, and then having to find where I left off again. But, dont get me wrong, I love the comments, some of them make me giggle.....maybe just put your comments in brackets, or stars....I think it would be easier for the reader....becasue I do love the blog and the comments, just hate getting lost when I am so into it!! And great job for using your new cam, the pics are great!! I know, I know. It makes them a little tougher to write, too, because I have the same thing -- scrolling up, scrolling down. I know there are ways to write footnotes into HTML so that you could click on the footnote, go down to read it, and then click the footnote at the bottom and get sent back up to the top, but I am not that advanced yet. I'll look into it. The footnotes will continue in the short-term, because a few posts are already written ahead that way, and also because I'm kind of attached to them personally. I use them now because I have a tendency to free-associate in the middle of writing a sentence (like with these parentheses right here -- or this bit here after the dash), and footnoting gives me one more place to stick stuff that's not directly related to the main sentence(1). (1)If I can even remember what the main sentence is by the time I get through all the punctuation. My dear neighbor just gave me an offshoot of her clivia - she has them all over her house, and every time I'm there, it seems like at least one is in bloom. All came from one plant she got about 7 years ago. She does have great light, but hers get nothing but light and water, no feeding, and they still bloom. You will do great. 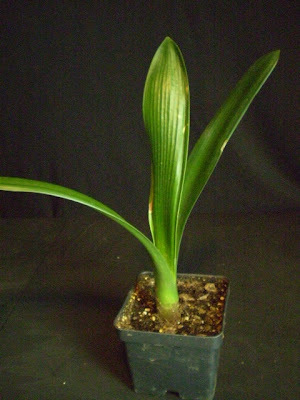 Like you, I'm a new cliviac, having just been given an enormous Clivia someone no longer had room to bring back indoors. It currently dominates our kitchen. My husband has dubbed it "Audrey lll". Great blog! I started by Clivia by off-set 6 years ago. Cared for it carefully for the first number of years, then neglected it horribly for a couple of years after the birth of my first child. The neglect has proven fruitful, as this year (plant is no quite large) is the first year to bloom (June/July). I've had several Clivias in the past ten years, gave many to friends and family, found them one of the easiest plant to raise. Sometimes one plant will have two flower spikes one right after the other. Mine will flower at least once a year and sometimes even twice a year. Right now I'm experimenting with growing a couple of Clivias in an orchid medium (Pine bark etc). It looks promising so far. 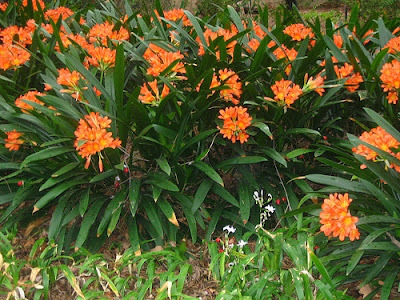 Clivias are from Africa where they grow more like epiphytes (on rocky formations etc) they are not really terrestrial plants. Expect that young offshoots, once separated from the mother plant, will take about two years before flowering. A ten year old mother plant will produce a lot of offsprings, sometimes 2 or 3 per year. I had a clivia that I managed to murder a couple of years ago. Before it was murdered, it had behaved excellently over the years, with bloom every winter after new year. I used to put it in a room upstairs where one of my sons used to live, every october or so. How I murdered it? A grandchild was here on a visit with three kittens, they liked to dig in the soil of the houseplants, so I put the poor clivia out on the porch, in the sun, which was not at all good for it... I might have tried to save it, but the sun gave it "a bad case of ugly", so I disposed of it. Now I have a new one, an offspring that I stole (!) from a little old lady's house (bad me, I watch her house and her plants through the year, as she lives elsewhere.) An easygoing plant, I would say. I just had to comment on this--I have been doing that sort of thing for years, and my family calls it "pinching an inch". I have beautiful indoor and outdoor specimens grown from swiped cuttings from restaurants, malls, hospitals, colleges, gardens and planters outside of places of business...over a span of many years. Sometimes if I'm going somewhere that I know has a coveted plant that would wilt or die in my pocket, I plan ahead and take a damp paper towel in a sandwhich bag, in my purse! But of course I never pinch an inch from a plant that's for sale. One time I embarrassed my sister and her husband (I'm a married 40-something woman) by spending about 15 min after dinner pulling up volunteer petunia and verbena seedlings from the cracks in the pavement out front at the pizza place! My brother in law didn't understand and kept accusing me of "weeding" the restaurant's sidewalk! (He also regards my basement plant lights with suspicion, being incapable of comprehending why someone would bother with all that if they can't make a financial profit from whatever they are growing). I guess this inch-pinching habit is one of the defining characteristics of a plant nut. And perhaps I should have a blog too, since I obviously have the parentheses and dash and "..." (whatever you call that) habit! PS: I was a Clivia virgin until last Christmas--gift from my husband. No news yet--looks the same as when he gave it to me (spent summer outdoors on shady porch), other than not currently blooming. It's now in the cool (60's) basement under those suspicious lights, so I'm hopeful that I'll have a nice January display, just when we need flowers the most!